Displaying correct times for the appointments when the clients and/or the server are in different time zones. Correctly evaluating recurrence rules with respect to Daylight Saving Time. To overcome these problems RadScheduler defines the TimeZoneID property. It uses TimeZoneInfoProvider capable of returning correct LocalToUTC and UTCToLocal information depending on the TimeZone RadScheduler should be operating under. If TimeZoneID is not set initially, the default time zone is (UTC). 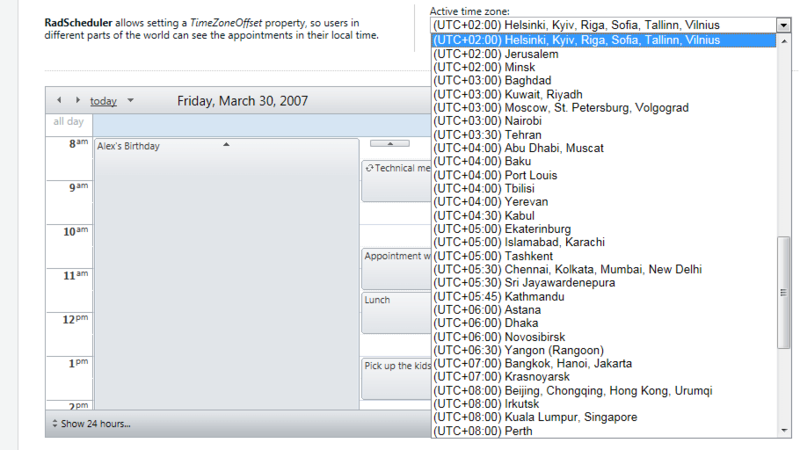 In addition to this a DataTimeZone field is added to enable eachAppointment to be set in different timezone. The provider and the specific settings in each TimeZone are responsible for all DateTime related calculations. If TimeZoneID property is not set the TimeZoneOffset property is applied. In this case during data binding RadScheduler assumes all dates to be UTC.If you use a custom provider or create the Appointment objects programmatically you should take care to convert the date-times to UTC by calling DateTime.ToUniversalTime() or by other appropriate means. This excample is showing how the TimeZoneOffset can be used in custom scenario without TimeZoneID and DataTimeZone properties. Drag a RadAjaxLoadingPanel from the toolbox onto your Web page. On the body of the loading panel, type the literal "Loading..."
Drag a Panel onto your Web page. Set its ID property to TimeZonePanel. Inside the panel, type the literal string "Active Time Zone:"
Following the literal string, drag a Label into the panel. Set its ID to "PleaseWaitLabel" and its text to "[Looking up time zone...]"
Drag a RadScheduler control from the toolbox onto your Web page. Bind it to a data source of your choice. 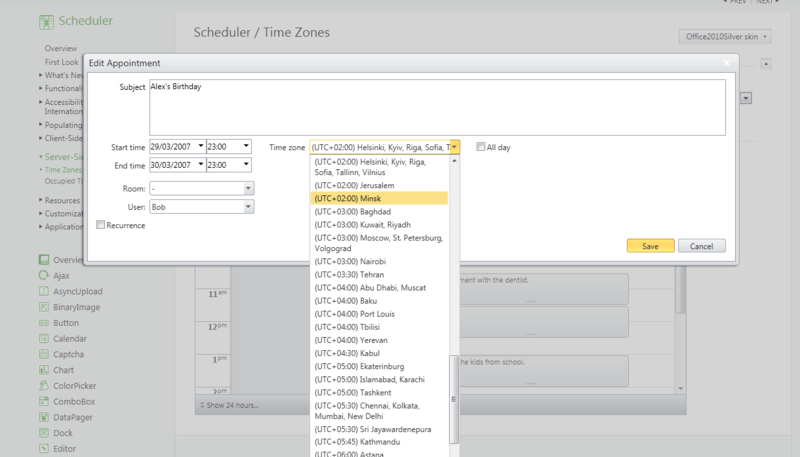 The drop-down list now allows the user to manually set the time zone of the scheduler. Drag a RadAjaxManager from the toolbox onto your Web page. In the RadAjaxManager Smart Tag, choose"Configure Ajax Manager". In the property builder that appears, indicate that both the scheduler and the time zone drop-down controls caninitiate requests and thatthe scheduler will be updated by requests. Assign the RadAjaxLoadingPanel as the loading panel when theRadScheduler gets updated.